The Meeting House Church is all about options. 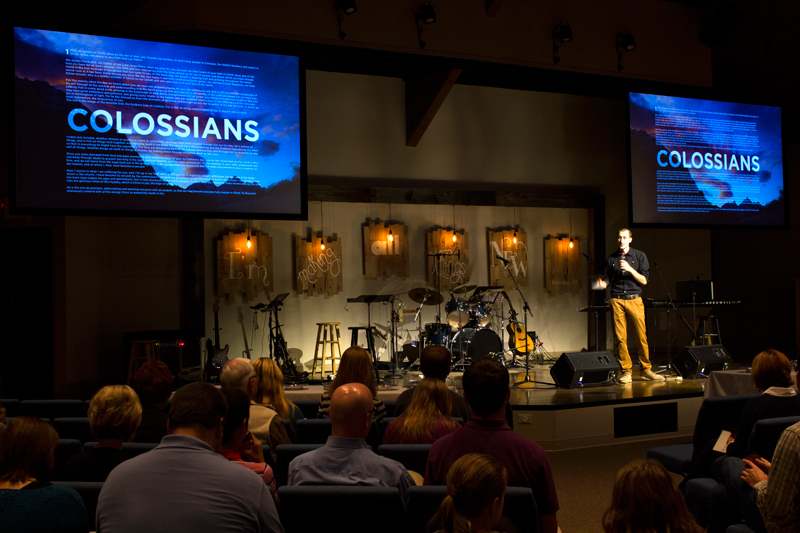 Based out of Carlisle, Pennsylvania, the church not only features different types of sermons to satisfy a diverse group of congregants, but services multiple locations as well. However, this isn’t a mega-church, but instead a way to service more congregants in a smaller, more intimate setting. It’s also extremely high-tech. It all started when the church moved into its current flagship Carlisle location in 1985. Ever since, the church has been growing—and outgrowing its venue. To accommodate everyone, the church started streaming live sermons from the sanctuary to a multi-purpose auditorium on the lower level in the early 2000s. This allowed the church to include more congregants every Sunday. In fact, people loved it so much, the church continued to grow even more. In 2007, both rooms were bursting at the seams, so they added a 650-seat auditorium. Then in 2015, a second campus was opened in Dillsburg, about 10 miles away. To keep congregants happy and costs down, the church wanted to record the Thursday night sermon in Carlisle and deliver it on Sunday to the congregants in Dillsburg. While that was going on, Carlisle would offer a live Sunday sermon in the sanctuary, while streaming it to additional congregants in the auditorium. The Carlisle-based design and integration firm Spire AVL was brought in to help make a high-tech wonder. Spire AVL set up cameras to capture the action in the Carlisle location, as well as a brand-new projector. 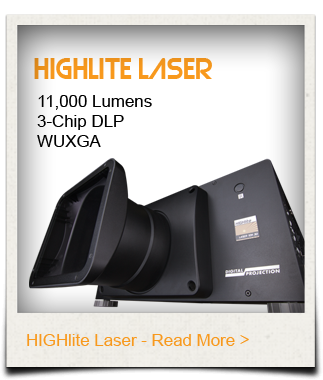 Digital Projection’s HIGHlite Laser Projector was brought in to be paired with the biggest of three screens in the Carlisle auditorium, when an older model had stopped working. The main screen delivers the live sermon from the sanctuary, while two side screens are showing secondary content. Besides cleaning the dust filter on occasion, the HIGHlite is incredibly low maintenance because it uses laser technology. It doesn’t need lamp replacements and boasts a 20,000-hour projected lifespan. This was good news to the people at the church, who had been previously spending $1,300 on a new lamp every year. Another bonus is that the HIGHlite Laser Projector also produces a gorgeous image. Despite different projectors and different locations, the two campuses are both part of The Meeting House Church. They are connected in name—as well as via technology. 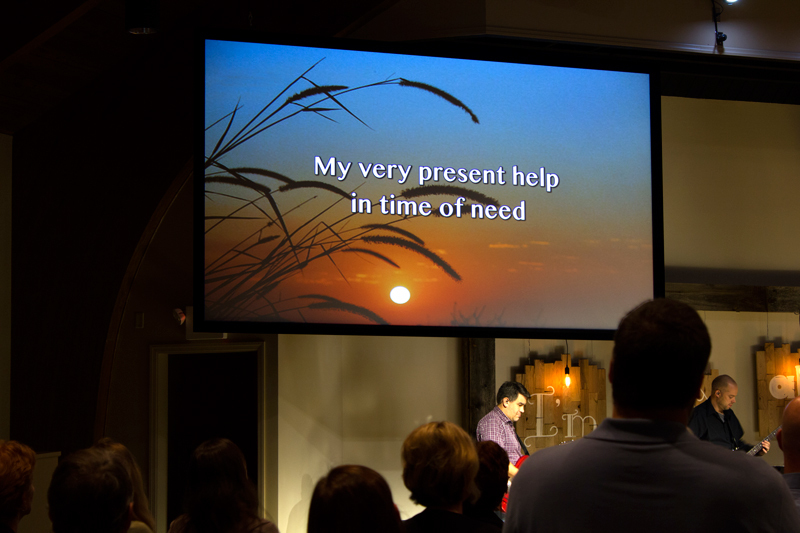 To make that connection, Spire AVL installed cameras that can capture the Thursday night sermon, which is then broadcast to congregants in Dillsburg on Sunday mornings. The church calls that Thursday program a “Dialogue,” since it doesn’t have any music and includes a Q&A. Dillsburg congregants enjoy the recorded presentation on Sunday, which is broadcast to a large screen via DPI’s E-Vision 7500 projector. Two side screens show additional content using a pair of E-Vision 6500s. The Dillsburg setup is very similar to the auditorium in Carlisle. However, that flagship location has only two projectors in the sanctuary venue. Every Sunday, those two projectors flank the sides of the church, showing secondary content to complement the live sermon. Then, everything is streamed to the auditorium as it happens live. To appeal to the diverse congregation, the church offers a variety of services. On Sunday, the first hour is a classic sermon. “Classic is a more traditional approach to worship; it’s not completely void of any contemporary songs, but those contemporary songs, if done, would be done with a traditional flavor,” Hallman said. The second hour is an “acoustic” service, which Hallman said is “more like a coffeehouse approach to worship.” It features acoustic guitar, piano, percussion, and bass. “It has a much more of an intimate feel to it.” The auditorium also offers two “modern” services, which include bass, drums, electric guitar, and more. Currently, the main sanctuary in Carlisle seats about 400 congregants, with the auditorium able to accommodate 650 more. The Dillsburg location houses another 300. Each location features multiple screens, designed to pack a big punch without overpowering the room. Despite the personal touches, every Sunday at The Meeting House Church a big AVL production. In the Carlisle location, there’s typically one person mixing audio, one running the sermon content and recording, and another person running with projection and lighting. However, Spire AVL tried to make the process as simple and smooth for The Meeting House team. With the church constantly growing, some would assume that The Meeting House would want to go the mega-church route. At one point back in 2006, they did have a plan to create a 1,250-seat auditorium. However, the multi-site experiment has paid off. “We’ve discovered that it’s much more effective for us to stay small and introduce more and more venues,” said Hallman. We would like to thank Spire AVL for the use of images used in this case study.